Everyone wants to be the last person to move to paradise. I've lived in some wonderful spots like Nova Scotia and northern New Brunswick. Those were places with raw beauty, and climates harsh enough to test the hardiest among us. With climates like that not a lot of folks sign up for these spots even with all the magnificent scenery. Then there are places like the Outer Banks of North Carolina. Some of these spots also have pretty harsh weather. On a recent visit to Cape Lookout, our guide pointed out an automated NOAA weather station which had to be replaced when winds over 160 mph destroyed part of it. Yet people had built houses out there at one time. Of course the northern Outer Banks are almost sinking under the weight of beach homes. The chance of a devastating hurricane hitting increases as each year passes, yet people keep building. It's a battle between humans and mother nature that humans will eventually lose. There are lots of places on the coast where homes have survived for hundreds of years when they're not on the barrier banks themselves. Should we just let the barrier banks disappear? Actually I don't think we will have much to do with it unless we get the political will to stop global warming so the oceans won't rise. I think the best we can is to keep homes away from places which shouldn't have homes. 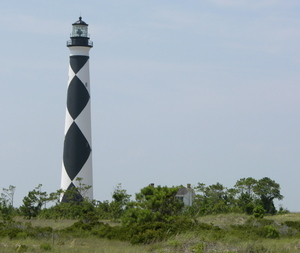 We protect places like Cape Lookout by walking lightly and making sure that we leave as few traces as possible. We make certain that we respect the vegetation that is planted to hold the fragile dunes in place. We do everything possible to properly manage the wild life that has become indigenous to the Outer Banks. As I look at this Carrot Island pony (Carrot Island being just across Taylor's Creek from Beaufort, NC), I can only hope that that everyone can work together to enjoy these precious places and make certain that they are there for the next generations to marvel at when they get the opportunity to see what a beautiful world has been entrusted to us. So far we aren't doing very well at taking care of it, but there are places like Cape Lookout which have survived and that we need to keep wild if only so for a few magical moments we can lose the craziness that cities create. Wilderness renews the human spirit. Protecting the wilderness builds a community of people who understand how to make a better world. 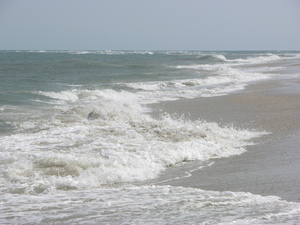 Anyone who cannot momentarily lose their problems and worries by walking a beach like this one on Cape Lookout really needs to take some time to repair their connection with the natural world. As I walk down a beach like this, I'm in awe of the power of the ocean and my insignificance in the grand scheme of things. There are no tracks in front of me. Our footprints wash away almost immediately as we pass by. I'm glad to be not alone in this huge world. Having my wife join me on the beach for an almost silent walk is one of the most reassuring moments in life. Yet I know that we aren't alone on the beach, and the moments of serenity that we enjoy are not by the grace of man. In a world of teeming masses it is easy to get lost or to lose your humanity, but here on the beach it seems much easier to find compassion for others and renew your belief in mankind. It's a time to think clearly while admitting that we're just another grain of sand in this universe that often seems out of control. Yet the awesome and unrelenting power of the waves helps me understand we're lucky grains of sand to still be able to visit, even for a short time, such a wonderful place that some very wise people took the time to protect years ago.